The Uragh Stone Circle is a neolithic stone circle near Gleninchaquin Park, Tuosist, County Kerry, Ireland. Situated near Lough Inchiquin, it consists of five megaliths. 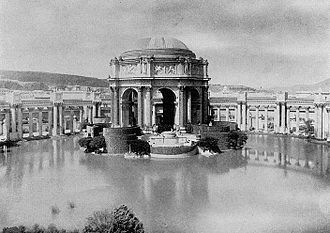 The largest stone is ten feet (3 m) high and the circle is eight feet (2.4 m) in diameter. There are two brilliant quartz stones at the south, as well as one off center within the ring. The Carnac stones are an exceptionally dense collection of megalithic sites around the village of Carnac in Brittany, consisting of alignments, dolmens and single menhirs. More than 3,000 prehistoric standing stones were hewn from rock and erected by the pre/proto-Celtic people of Brittany. 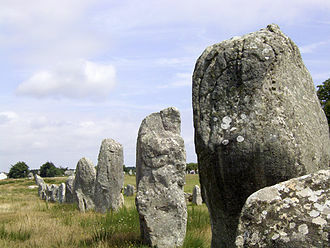 Most of the stones are within the Breton village of Carnac, the stones were erected at some stage during the Neolithic period, probably around 3300 BCE, but some may date to as early as 4500 BCE. Brittany has its own versions of the Arthurian cycle. 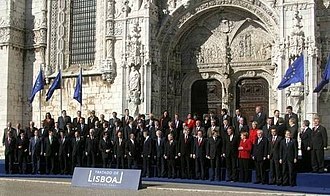 Local tradition claims that the reason they stand in such perfectly straight lines is that they are a Roman legion turned to stone by Merlin. In recent centuries, many of the sites have been neglected, with reports of dolmens being used as sheep shelters, even more commonly, stones have been removed to make way for roads, or as building materials. 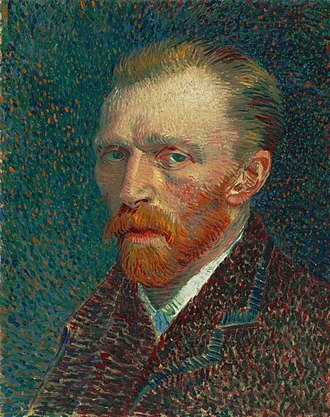 The continuing management of the remains a controversial topic. There are three groups of stone rows — Ménec and Kerlescan — which may have once formed a single group. Eleven converging rows of menhirs stretching for 1,165 by 100 metres, there are what Alexander Thom considered to be the remains of stone circles at either end. According to the tourist office there is a cromlech containing 71 stone blocks at the western end and this fan-like layout recurs a little further along to the east in the Kermario alignment. 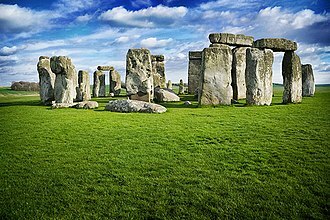 It consists of 1029 stones in ten columns, about 1,300 m in length, a stone circle to the east end, where the stones are shorter, was revealed by aerial photography. A smaller group of 555 stones, further to the east of the two sites. It is composed of 13 lines with a length of about 800 metres. At the extreme west, where the stones are tallest, there is a circle which has 39 stones. There may be another stone circle to the north, a much smaller group, further east again of Kerlescan, falling within the commune of La Trinité-sur-Mer. These are now set in woods, and most are covered with moss, there are several tumuli, mounds of earth built up over a grave. A high cross or standing cross is a free-standing Christian cross made of stone and often richly decorated. 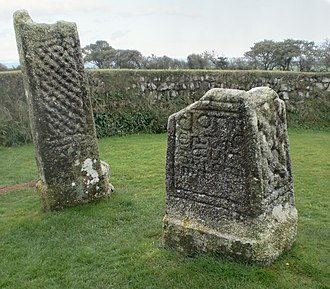 There was a unique Early Medieval tradition in Ireland and Britain of raising large sculpted stone crosses, Anglo-Saxon examples mostly remained slender in comparison, but could be large, except in earlier Northumbrian examples their decoration is mostly ornamental rather than figures. The crosses often, though not always, feature a ring around the intersection, forming a Celtic cross. 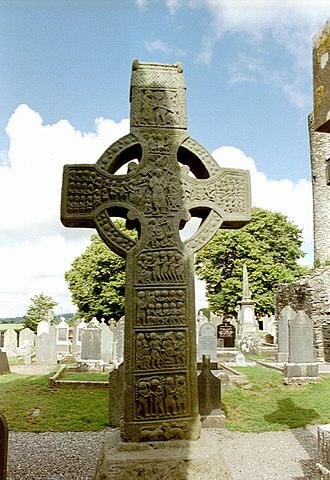 The term high cross is used in Ireland and Scotland. 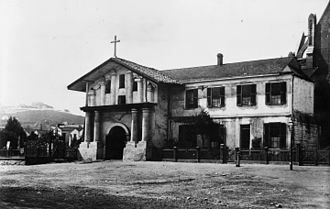 Some crosses were erected just outside churches and monasteries, others at sites that may have marked boundaries or crossroads, whether they were used as preaching crosses at early dates is unclear, and many crosses have been moved to their present locations. They do not seem to have used as grave-markers in the early medieval period. In the 19th century Celtic Revival Celtic crosses with decoration in a form of Insular style, became popular as gravestones and memorials. Unlike the Irish originals, the decoration usually does not include figures, High crosses are the primary surviving monumental works of Insular art, and the largest number in Britain survive from areas that remained under Celtic Christianity until relatively late. Saint Adomnán, Abbot of Iona who died in 704, mentions similar free standing ringed wooden crosses, perhaps the earliest surviving free-standing stone crosses are at Carndonagh, which appear to be erected by missionaries from Iona. Fleeing the Viking raiders, giving Iona a critical role in the formation of ringed crosses, the round bosses seen on early crosses probably derive from Pictish stones. High crosses may exist from the 7th century in Northumbria, which included much of south-east Scotland. Most Irish High crosses have the shape of the ringed Celtic cross, and they are generally larger and more massive. They have probably more often survived as well, most recorded crosses in Britain were destroyed or damaged by iconoclasm after the Reformation, the ring initially served to strengthen the head and the arms of the high cross, but it soon became a decorative feature as well. Poulnabrone dolmen is a portal tomb - one of approximately 174 in Ireland - located in the Burren, County Clare, Ireland. It dates back to the Neolithic period, probably between 4200 BC and 2900 BC and it is situated 8 km south of Ballyvaughan,9.6 km north-west of Kilnaboy. 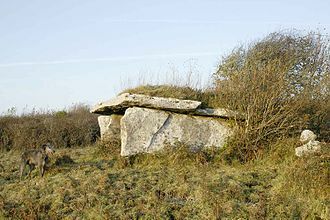 The tomb is located in a field in the townland of Poulnabrone, parish of Kilcorney, close to the R480 road. Poulnabrone is sometimes translated as Hole of Sorrows. 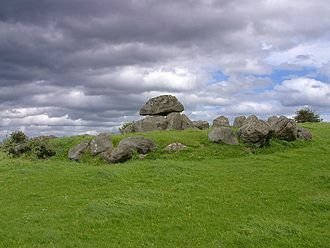 However, brone is derived form the Irish bró, meaning quern, the cairn helped stabilize the tomb chamber, and would have been no higher during the Neolithic. The entrance faces north and is crossed by a low sill stone, a crack was discovered in the eastern portal stone in 1985. 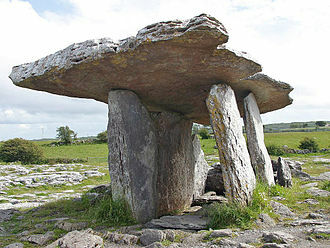 Following the resulting collapse, the dolmen was dismantled, and the stone was replaced. 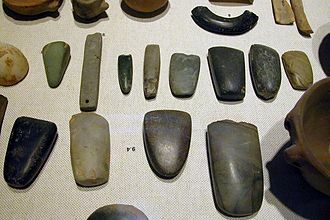 Excavations during that time found that 33 people, both adults and children, were buried under the monument, personal items buried with the dead included a polished stone axe, a bone pendant, quartz crystals and pottery. There were no intact skeletons, indicating the site was not used as a place in the sense that bodies were placed there immediately after or even close to the time of death. Bones were found in the strata, but jumbled chronologically. Only one of the adults seems to have lived past 40, the children had teeth showing signs of illness and malnutrition. Those selected for deposit at this site were apparently the members of some sort of elite and their bodies were left elsewhere to decompose, in a protected location, as none of the bones show any signs of teeth marks. Only the bare bones were taken here and deposited. As some of them show scorch marks, they may have ritually purified by fire beforehand. According to Radiocarbon dating, the tomb was used between 3,800 and 3,200 BC. The findings are now at the Clare Museum, loaned from the National Museum of Ireland, in the Bronze Age, a newborn baby was buried in the portico, just outside the entrance. With its dominating presence on the landscape of the Burren. The Wotanstein, known as Wodanstein or earlier on Malstein, is a small megalith or menhir situated close to the village of Maden, Schwalm-Eder-Kreis, Germany. The megalith is situated on the south-west corner of the village of Maden, the land on which it stands has an elevation of 177 m. It is on the east side of the road goes to Obervorschütz. The stone is c.2.12 m high,1.2 m wide, the above-ground volume is thus 1.4 m3 and given quartzite has a density of 2,648 kg/m3, the above-ground stone weighs c.3.7 metric tons. For comparison, the mass of Riesenstein near Wolfershausen is ten times more. The excavation during the Seven Years War discovered the stone is as deep underground as it is high above-ground, its mass is closer to c.7.5 metric tons. It is composed of Neogene Miocene quartzite, in contrast to quartzites produced by metamorphism, the Tertiary sedimentary quartzites were the product of intense weathering of local Triassic Buntsandstein sandstones in a tropical climate. The quartzite does not locally outcrop, so that the stone must have brought to this place. The stones longest horizontal axis strikes N065 ± 5° and it stands vertically, the largest faces are directed towards c. 155°, i. e. south-south-east and 335°, north-north-west and it is not known for certain when the megalith was erected or for what reason it was placed in this location. However it is presumed from finds at other similar megaliths in the area that it was erected in the 3rd Century BC. Later, around the 1st Century BC, it was most probably used by the Chatti to worship Odin, in 1407 the stone was mentioned in documents as deme langen steyne zu Madin. According to oral tradition, during the Seven Years War it was excavated because it was rumoured that treasure was buried under it and they discovered the stone was as deep as it is high. The first Christian church in Fritzlar was built by Saint Boniface from the wood of the Donars Oak and it is said that the Devil, who lived on Mader Stein, wanted to destroy the church with a stone. There are two different versions of the part, Either the stone caught in his sleeve, or the stone was deflected by the upheld shield of the archangel Michael. The Tumulus of Bougon or Necropolis of Bougon is a group of five Neolithic barrows located in Bougon near La-Mothe-Saint-Héray, between Exoudon and Pamproux in Poitou-Charentes, France. Their discovery in 1840 raised great scientific interest, to protect the monuments, the site was acquired by the department of Deux-Sèvres in 1873. Excavations resumed in the late 1960s, the oldest structures of this prehistoric monument date to 4800 BC. The site is located on a limestone plateau within a loop of the river Bougon, the area used to be known as Les Chirons. The stepped mound, erected in the early 4th millennium BC, has a diameter of 42 m and its large rectangular chamber lies south of its centre. It is connected by a non-centrally placed passage, there is evidence that the passage was still used by the 3rd millennium BC. The chambers walls contain artificially shaped orthostats, the gaps were filled with dry stone walling, the chamber is covered by a capstone which weighs 90 tons. It is supported by two pillars, which serve to subdivide the chamber. 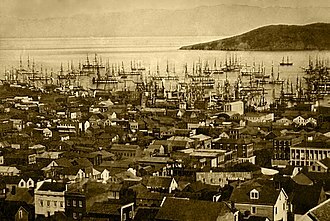 During its excavation in 1840, about 200 skeletons were discovered in three layers, separated by stone slabs, the vague reports of that early excavation prevent any detailed chronological analysis. Accompanying finds included flat-bottomed and round-bottomed pottery, pierced teeth, chains of seashells and stone tools, more recent excavations showed that the grave was abandoned shortly after its construction. The passage had been blocked with a stone slab. At its base lay the skull of a man who had undergone three trepanations during his lifetime, pottery was found in front of the monuments facade, suggesting that cult activities, entailing the deposition of pottery, took place after its closure. About 1,000 years later, the monument was re-used for more burials by people of a different culture who reached the passage from above, Tumulus B is a long mound,36 m long and 8 m wide. Two of them are very small cists, with no access passage, the mounds west part has two larger rectangular chambers, each accessible via a passage from the south. The Lancken-Granitz dolmens are a group of seven megalith tombs in the Lancken-Granitz municipality on Rügen, northern Germany. Erected during the middle Neolithic, when they were used by the Funnelbeaker culture, three of them are encircled by solitary rocks forming either rectangles or a stone circle, one has a solitary guardian stone on its eastern side. The dolmens were constructed from glacial boulders and red sandstone. In part subdivided into up to four compartments as common for the region, one showed a subdivision into six such compartments. A group of seven dolmens is lined up northwest of the road between Lancken and Klein Stresow, numbered 1 to 7 from the northeast to the southwest and this numbering follows Schmidt, other publications use different numeration codes. Dolmen Nr.6 and Nr.5 and Nr.6, the dolmens are part of a series built between 3,500 and 3,200 BC, during the Neolithic. As of 2001, about 400 of those are preserved in Mecklenburg-Vorpommern,55 of which are located on the isle of Rügen. Initially their number had been larger, but many were destroyed when their boulders were used for church, housing. This was part of a series of 106 excavations conducted by Schuldts team on megalith sites in present-day Mecklenburg-Vorpommern between 1964 and 1972, both Hünenbett shapes are oriented from east to west, and their long sides measure 20.5 metres and 20 metres, respectively. At the Hünenbett around dolmen Nr,3, only 16 boulders are still in place, while initially each long side had comprised 13 boulders. A guardian stone is placed adjacent to its narrow side. The stone circle around dolmen Nr.6 has a diameter of 12 metres, the dolmens are located in the center of their respective encirclements or at its western end. All dolmens were constructed from glacial boulders, with the gaps filled with plates of red sandstone. The entrance was made from two upright sandstone plates covered by another rock. Similar sandstone plates were used to subdivide the interior of some of the dolmens into a hallway with adjacent compartments,1, the largest one, had three such chambers on each side of the hallway, while a subdivision could not be demonstrated for dolmen Nr.2. Zorats Karer, called Karahunj, Qarahunj or Carahunge and Carenish is a prehistoric archaeological site near the town of Sisian in the Syunik Province of Armenia. It is referred to in international tourist lore as the Armenian Stonehenge. It is located on a promontory near Sisian. The name Carahunge is interpreted as deriving from two Armenian words, meaning stone, and hunge or hoonch, meaning sound, thus the name Carahunge means Speaking Stones. In 2004, the site was named the Karahunj Observatory. Carahunge is known in local lore as Zorats Karer, Dik-dik Karer, the Carahunge Monument consists of the following parts, the central circle, the north arm, the south arm, N-E alley, the chord and separate standing stones. The site is rich with stone settings, burial cists and standing stones - Menhirs, the heights of the stones range from 0.5 to 3 m and weight up to 10 tons. They are basalt stones, eroded by time and covered with moss, the inside surface of holes preserved much better. There are broken and unnumbered stones. About 80 of the feature a circular hole, although only 37 of the stones. They have been of interest to Russian and Armenian archaeoastronomers who have suggested that the stones could have been used for astronomical observation. Seventeen of the stones were associated with observations of sunrise or sunset at the solstices and equinoxes, this must remain conjectural as the holes are relatively unweathered and may not even be prehistoric in origin. The astronomical significance of megalithic structures at Zorats Karer was first explored by Armenian archaeologist Onik Khnkikyan in 1984, investigation by radiophysicist Paris Herouni and his research team during 1994-2001 led them to the now disputed conclusion that Carahunge is the worlds oldest astronomical observatory. 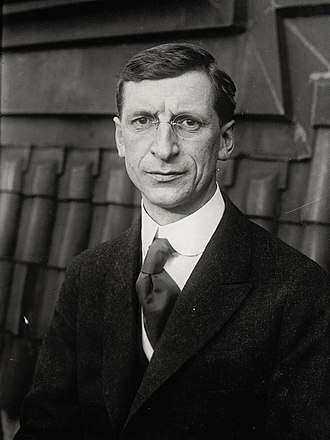 In a letter to Herouni, Professor Hawkins confirmed his Armenian colleague’s similar conclusions about Zorats Karer, stating, in particular, “I admire the precise calculations you have made. I am most impressed with the work you have done. The Knocknakilla megalithic complex that lies between Macroom and Millstreet, in County Cork, Ireland. 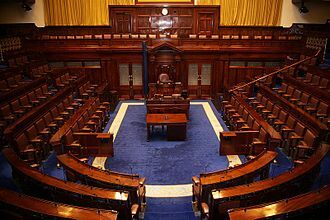 It is set in blanket peatland on the north-west upper slopes of Musherabeg mountain and is thought to be 3500 years old, the area is rich with archaeological artifacts, and nearby are two cashels, a ringfort, two fulacht fiadh, a possible souterrain and a circular enclosure. The complex is best known for its large phallic and now leaning portal stone, the stone circle is made up of five 1. 3- to 1. 5-metre-high stones, of which two fell sometime in the last 50 years. Only the two portal stones and a stone at the west stand today. Three meters away is a 10-stone,3. 5-metre-diameter, radial cairn which was first discovered by Coillte Teoranta in 1970, the upright standing stone is 3.7 metres tall, and it leans heavily to the north. Near the main site, a Dolmen made up from a flat capstone supported by three upright stones is a modern re-construction. List of megalithic monuments in Cork Power, archaeological inventory of County Cork, Volume 3, Mid Cork,9467 ColorBooks,1997. One of the chambers, exposed by 20th century quarrying. Artistic reconstruction of the cairn c. 4000 BC. View of the tumulus. The dolmen, on the middle-left part of the picture, is partially hidden by trees. 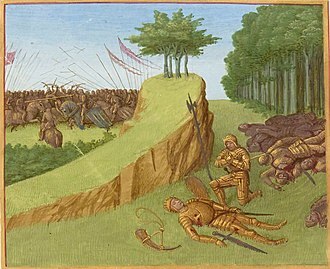 "Mort de Roland" (Roland's Death), Jean Fouquet, 15th century. Artistic reconstruction of the Grand Menhir Er Grah with the 18 other menhirs in a row. c. 4500 BC. Decorated slabs from the Gavrinis passage (replica in Bougon Museum). A decorated slab within the passage; note the anthropomorphic "shield" motif on top. Finding Carrowmore: Approaching from the south (N4) after Collooney roundabout, exit Strandhill/Airport. Follow route Strandhill (R292). Take the right exit at Ransboro roundabout, centre is 1 km further on, on the right. Approaching from the north (N15), cross Hughes Bridge in Sligo town, and at the 5th set of traffic lights after the bridge turn right onto Church Hill. After 2 km take a left fork, signed Carrowmore. The centre is located 1 km from here, on the left. View from Carrowmore of Ballygawley Hills to S/E, with a megalithic tomb on top of each. The megalith Riesenstein from the north. HDR Image.